In this comprehensive introduction to SPSS, Jeffery Aspelmeier and Thomas Pierce explain the procedures and concepts of SPSS in a way that is easy to understand and vividly illustrated with cartoon-based scenarios. 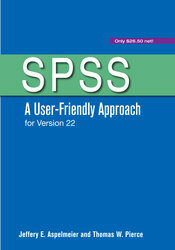 SPSS: A User-Friendly Approach goes beyond providing instructions on the mechanics of conducting data analysis and develops a student’s conceptual and applied understanding of quantitative techniques. Readers also learn how to complete a procedure and ensure that the results are statistically meaningful.